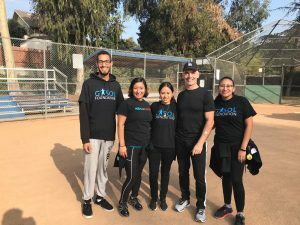 Gasol Foundation had a great time collaborating with our friends over at Children’s Hospital Los Angeles at the annual Fitness Challenge on Thursday, October 25th! The event was held in Los Angeles at the Bellevue Recreation Center from 9:30 a.m. to 1:30 p.m.
What is the Fitness Challenge? 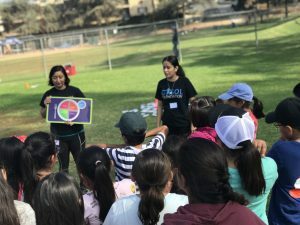 The Fitness Challenge is a yearly event organized by Los Angeles City Councilmember Mitch O’Farrell’s office to offer more opportunities for children to be active. 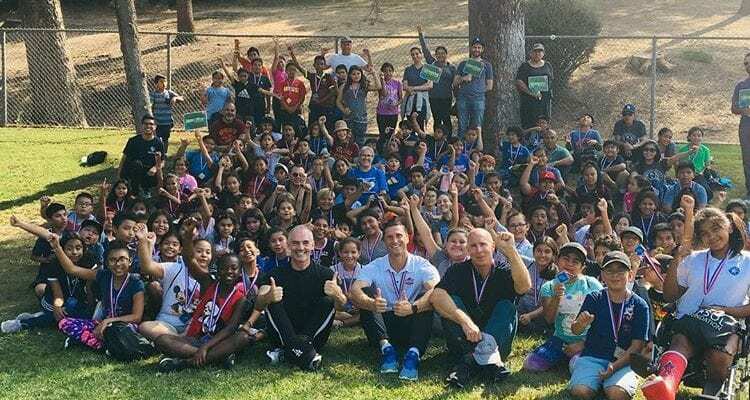 O’Farrell brought together several organizations, including the City’s Department of Recreation and Parks (RAP), LA84 Foundation, The Klub Gymnastics, YogaWorks, and of course, Children’s Hospital LA and Gasol Foundation. Around 125 5th graders from Kingsley, Rosemont, Glenfeliz, Dorris Place, and Vine Street Elementary schools were present. Besides councilmember Mitch O’Farrell being at the Fitness Challenge, also in attendance was four-time Olympic Gold Medalist Lenny Krayzelburg, who kicked off the event with a few warm-up activities for the children! 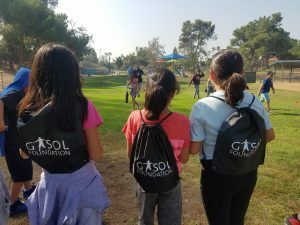 As previously mentioned, Gasol Foundation and Children’s Hospital Los Angeles joined forces in order to provide the children with a general healthy lifestyle introduction that focused on healthy eating, sleep quality and duration, and emotional wellbeing. In the healthy eating rotation, the kids learned about My Healthy Plate and even played a My Healthy Plate competition game. During this specific rotation, the children learned that in order to grow up strong and healthy, it’s necessary to eat a variety of foods from all the food groups. The goal is to have their plates look like a rainbow for every meal! During the sleep quality and duration rotation, the children played a sleep-themed game of tag where those who were tagged had to do 10 jumping jacks -10 being the total number of hours they should sleep every night. This can be accomplished by setting proper bedtimes and waking times! Lastly, the final station was all about emotional wellbeing. This rotation involved having the children create cards for the kids at Children’s Hospital LA. On these cards, they wrote inspirational messages and drew positive images. This rotation educated the children on the significance of spreading kindness. When we spread both kindness and happiness, we not only make the individual on the receiving end feel good, but it makes us feel good as well! Gasol Foundation also received a Certificate of Recognition from one of the councilmember representatives, thanking us for our participation, hard work, and involvement at the event, and within the community! Additionally, during the event, we were given the opportunity to create even more awareness on childhood obesity through an interview with Telemundo television! We cannot thank Councilmember Mitch O’Farrell and Children’s Hospital LA enough for all of their efforts and hard work. We are very appreciative and grateful to have had the chance to work with them on such an amazing event. All of the kids had so much fun, and most importantly, learned that healthy habits can be fun! Do you follow the 60 minutes of physical activity per day recommendation? Want to learn more about the importance of physical activity and how you can be more active? Click here or, to acquire a better understanding of all our healthy habits overall, click here.